How do kids learn about money? It certainly doesn't happen by osmosis, though there is something to say about teaching by example. While kids don't magically learn to become financially responsible, they also do not usually learn sound personal finance practices in school. Instead, they must be taught the principles of sound personal finance at home and be allowed to practice them (on an appropriate scale) from an early age. When you decided to raise children, it probably wasn't lost on you that it would be up to you to help shape this little human being into a young adult and beyond. You probably realized that you'd have to teach your child to talk, to ride a bike, and maybe even how to share. But did you ever think that you'd have to teach them about money? If you didn't, you are not alone. Most people cannot pinpoint a specific money lesson that wasn't learned the hard way: through experience. But you can, and should, teach your child about money and personal finance. 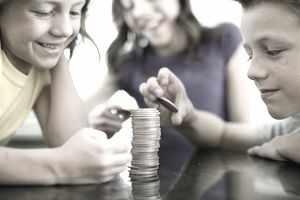 In fact, in his book titled Allowances: Dollars and Sense, financial planner Paul Lermitte outlines a system for teaching your kids about money. But beyond this system, he also talks about the dangers that parents face when they don't have a system for teaching their kids healthy habits and attitudes about money. Financial Dependency: Your kids could become financially irresponsible, have poor money skills, become deeply in debt, and/or remain financially dependent on you. Destructive Values: Your kids could develop a destructive relationship with money, equating it with self-worth or becoming addicted to possessions. They may believe that their happiness depends on having all the latest gadgets and toys. Debt: Your kids could become victims of paralyzing credit card debt and have no understanding of how to set financial goals, save money for the future, budget, or be a wise consumer. Loss of Confidence: Your kids could lack the confidence to make sound financial decisions, which could affect other parts of their lives. Teaching the Wrong Thing: In spite of your good intentions, you could inadvertently teach your kids the wrong values about money. Family Conflict: Families are often torn apart by financial disputes. You need strong principles and a plan of action to avoid the tension and arguments over money that can destroy family relationships. So how will you teach your children to be more financially successful, avoid living from paycheck to paycheck, and steer clear of crippling credit card debt? It all starts with purposeful and guided experience. If you want your kids to grow up to be financially responsible adults, you have to let them handle money often and from an early age. They need to practice spending, saving, and even banking. They need to learn what it feels like to "blow" all of their money on something frivolous and not have money available for something they really want or need. But where do you begin? Talking About It: Discuss money issues with your kids on an ongoing basis. That is not to say that you should burden your children with money issues or any family financial hardship, but rather that you should take ample opportunity to discuss money and personal finance decisions with your kids. Start Early: It's not just about talking about it, it's about starting early. It's preferable to start discussing money with your kids by age five or six. At that age, it will just be the basics, but it's crucial that they understand that things cost money and how that money is made and handled. It's not a bad idea to open up a simple savings account in your child's name that they can begin learning to use. Give up Control: Let your kids do things themselves. Let them make bank deposits and withdrawals in their own account (with your help). Let them make their own purchases with the money they have, whether it's birthday money from grandma or money they've earned through special chores. Let them decide what they want to spend their money on. Offer advice, but let them do it themselves. It's a much smaller scale and safer version of learning through (guided) experience. Let Them Make Mistakes: Along the same vein as giving up control, letting your kids make mistakes is part of teaching them. Even if you think your kids are spending their money on the wrong things, let them do it. They'll learn from it, and you can talk about it. Set Limits: While you're talking about money, starting early, giving up a little control, and letting your kids make some mistakes, you do still want to set limits. Set limits to keep their mistakes limited to small-scale lessons. Set limits like amounts of money high enough to learn about critical financial principles, but not so high that they begin to think money is unlimited. Let them learn to make choices based on financial limits. Provide Structure: Last, but not least, structure your lessons. A structure will help your kids establish a consistent saving and spending plan so they will have some type of system to work within as you help them and let them learn financial principles on their own. How can you teach your kids to value money when they don't work for a living? When do you start giving your kids an allowance and how much should it be? How do you teach them to save for the medium- and long-term? Where do you draw the line between "wants" and "needs?" How do you help them make wise buying decisions? How can you be generous with your kids without spoiling them? You can help your kids learn the money management skills that will make them smart consumers and financially responsible and successful adults, but only if you start early and follow a system of teaching and practical experience. Is a Tax Refund Gift Card Right for You? Should I Get a Refund Anticipation Loan? Will Working a Second Job Affect My Taxes? What Forms Do You Need to File Your Taxes?